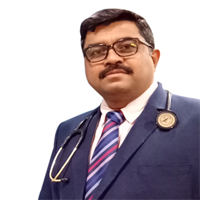 Dr. Mahesh Chavan is a Consultant Endocrinologist at Apollo Sugar Clinics and Apollo Hospitals, Belapur, Navi Mumbai. He has previously worked in prestigious institutions and has contributed immensely to the department of endocrinology. His special interests metabolic bone diseases, endocrine tumors, and thyroid disorders. He has published several research papers on hyperthyroidism, cardiac metastasis in thyroid carcinoma and many others. MD (General Medicine), Shivaji University, Kolhapur. DNB (Endocrinology, Diabetes, Metabolism), National Board of Examination. Fellowship in Endocrinology PD.Hinduja, Mahim, Mumbai. Member, Endocrine Society of USA. Unusual case of cardiac metastasis from Thyroid Carcinoma;Indian Thyroid Association-Annual Conference;ITS 2008;Chandigarh. I am Balaji and I work for ONGC. I was referred to Apollo Sugar by my medical professional. Before coming here, my HbA1c was 8.9. I was a low-grade diabetic and it had progressed to high diabetes. After my diabetes treatment with Dr. Mahesh Chavan, my HbA1c has dropped down to 6.8. I am happy with the treatment and the medication prescribed by the doctor. I would recommend Apollo Sugar for world-class diabetes care. I am Manohar Khandual and I am 60 years old. Back in 2016, I underwent a bypass surgery. After that, I used to get wounds and they would not heal easily. I February, 2018, I consulted Dr. Mahesh Chavan at Apollo Sugar Clinics. After following his treatment, all my wounds got healed in a period of 3 to 4 months. There is a drastic change after following the dietary changes prescribed by him and taking my medication. I am now able to walk and even jog! Thank you Apollo Sugar Clinics. I have diabetes for the past 4 years and I had consulted Dr. Mahesh Chavan for my diabetes. Before I had consulted Dr. Mahesh Chavan, my blood sugar levels were high. My fasting blood sugar level was 290 mg/dL and my postprandial blood sugar level was 490 mg/dL. Dr. Mahesh Chavan had suggested me to opt for insulin therapy. I was really depressed to take insulin injections. However, the dietician at the clinic had explained the benefits of insulin therapy and had morally supported me in the time of distress. After starting the treatment regimen, now my diabetes is totally under control. Now, my fasting blood sugar levels is below 100 mg/dL and my postprandial blood sugar level is below 113 mg/dL. I am very confident with the treatment provided by Dr. Mahesh Chavan and Apollo Sugar Clinics. I am a 75-year old person with diabetes for the past 30 years. I have some leg problems and my serum creatinine was also quite high. I was referred to Dr. Mahesh Chavan of Apollo Sugar Clinics, Navi Mumbai by one of my close friends. After consulting him, my leg problems due to diabetes disappeared and my serum creatinine also came back to normal levels. Before consulting Dr. Mahesh Chavan, my blood sugar level was 380 mg/dL. After the treatment my blood sugar level dropped down to 145 mg/dL. I am really happy with the way the doctor communicated with me. It was like a father-son relationship. Now, I am perfectly healthy thanks to Apollo Sugar! I am Shekinah Ali from Jabalpur. I am a 22-year old with type 1 diabetes for the past four years. Two months before, I developed ketones in my body and my blood sugar levels were out of control. I was hospitalized for this. When I was referred to Dr. Mahesh Chavan of Apollo Sugar Clinics, Navi Mumbai, I visited the clinic. After the consultation, I gained good control of my blood sugar levels. I am quite happy with the treatment provided by Dr. Mahesh Chavan and the support extended by the care team including the dietician and the diabetes educator.